Based in Garner, NC, Melanie Tucker has been working in the health and fitness industry since 1998 and writing related articles since 2007. Tucker's articles appear in a monthly newsletter for "Female Fit Camp" and can also be viewed on various websites. She has accumulated several nationally recognized certifications and is a Master Practitioner working toward her Bachelor of Science in nutrition sciences. The Pilates Reformer is the central piece of Pilates equipment used for wide variety of exercises performed in different positions. The number of calories burned on a Pilates Reformer depends on your weight, level of exertion and time spent exercising. A beginner, weighing about 150 lb. can burn 250 calories in 60 minutes using a Pilates reformer, while an advanced exerciser at the same weight can burn approximately 450 calories in the same amount of time. Keep in mind that you need to burn 3,500 more calories than you take in as food to lose 1 pound. Adding a jumpboard to the foot of your Pilates Reformer allows you to "jump" while lying down. This low-impact exercise gives you the aerobic benefits of a rebounder while protecting your knees and back from the jarring impact of landing. While using a standard rebounder, you'll burn 321 calories during 60 minutes of exercise. Your results using a Pilates jumpboard will vary according to the intensity of your workout. When Pilates is compared to general exercise, the calories burned falls somewhere in between running and walking. 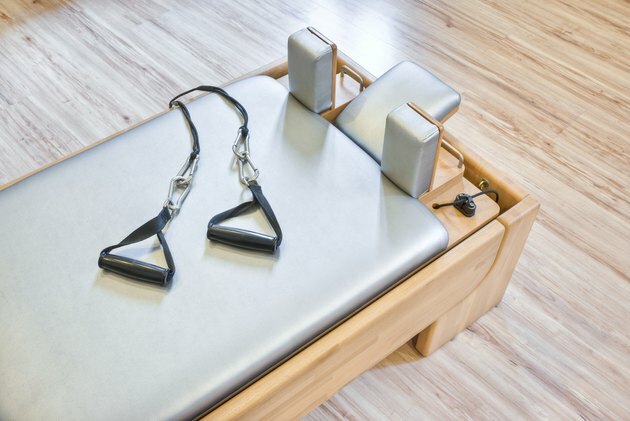 It is possible to lose weight by using a Pilates Reformer as your exercise choice; however, if your main objective is weight loss, then Pilates may not be the most effective form of exercise. The benefits of using a Pilates Reformer go far beyond calorie burn. Pilates builds lean muscle, which changes the shape of your body. The entire body gets a workout, although the focus is on the core, which helps create balance and a decrease in waist size. You stand to increase flexibility, decrease back pain and improve your posture. The bottom line is that working on a Pilates Reformer supports weight loss and allows for other important gains.